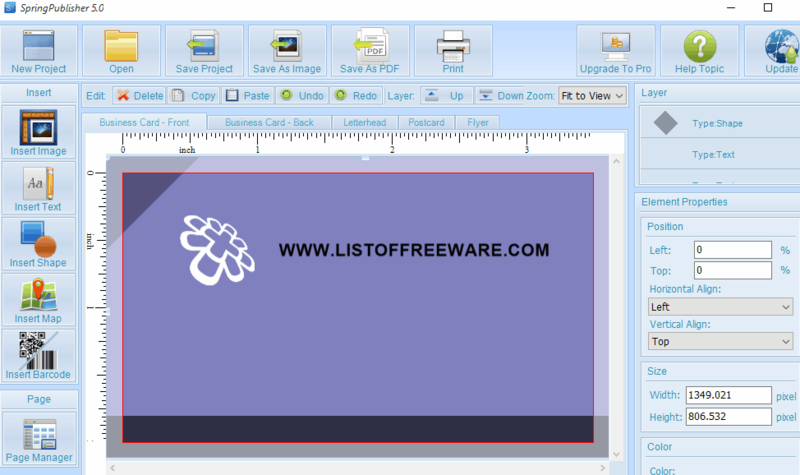 Here I am going to present a list of best free desktop publishing software for Windows. These software let you create documents and prepare them to be published online. You can create and design Business cards, Letterheads, Book Covers, Greeting Cards, Posters, Brochures, Web Pages, etc. with these software. Some of these DTP software are totally free while some are available free of cost with some limitations. You can also work on more than one documents using some software. Some desktop publisher have a list of templates which will help you in designing documents. All of these software have some features in common with some differences. Desktop publishing is the process of creating documents with the help of page layout, images, text, shapes, etc. This article will help you to simplify your job of creating Newsletter, Business card, Letterhead, Book covers, etc. You can use text, images, shapes, templates, colors, logos, map, barcodes, etc. Some software support multiple tabs so that you can design and create multiple designs at a time. You will find that some word processing software can also be used as desktop publishing software. These can also be used as Book publishing software and Newsletter publishing software. You will learn how to design documents for publishing and also learn the process to ready documents to publish. My favorite free DTP software is Scribus. You can use this desktop publishing programs without any limitation. You can use various text styles and formats, layout formats, geometrical shapes, barcodes, etc. It is cross-platform and supports multiple tabs. So you can work on more than one project at a time. This desktop publishing software has features which could be helpful in designing as well. You just have to learn how to use these features. You can also check out these list of Best Free Barcode Generator Software For Windows, Best Free Broken Shortcut Fixer Software For Windows, and Best Free Hard Drive Repair Software To Fix Bad Sectors. Scribus is a free desktop publishing software. It is specially designed to publish documents. It has a number of page formats and templates to choose from. You can insert frames, text, text box, various geometrical shapes, barcodes, etc. Use different fonts, insert images, export as EPS, PDF, SVG, and Image. Import text, image, vectors, and append. It supports ICC color management, CMYK color separation, Spot color, and PDF creation. This DTP freeware supports multiple tabs, means you can design more than one document at a time. It is a Cross platform desktop publishing software and supports Linux, BSD UNIX, Solaris, OpenIndiana, GNU/Hurd, Mac OS X, OS/2 Warp 4, eComStation, and Windows desktops. Supported Windows versions: Windows 10, Windows 8, Windows 7, Windows XP, Windows Vista, Windows NT, Windows ME, Windows 2000, and Windows 98. Note: You will have to install Ghostscript on you computer to be able to export documents as EPS files. 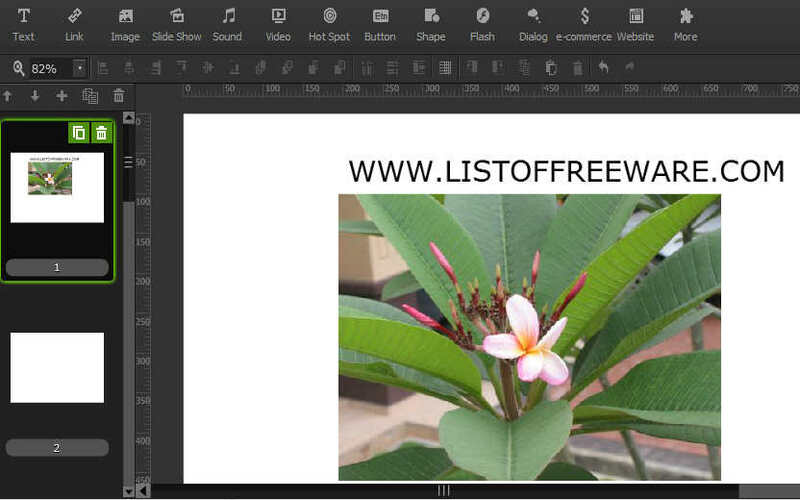 LyX is another free desktop publishing software. It lets you process documents using various styles. It has some awesome inbuilt features which make its versatile for desktop publishing. You can directly add text as: paragraph, quote, quotation, list, section, subsection, subparagraph, title, author, date, address, etc. You can insert mathematical expression using various mathematical operators and signs. This desktop publishing software lets you work in multiple tabs, insert label, insert index, use various bullets formats, insert notes, insert comments, import and export other documents, insert files, add box of different shapes and sizes, etc. You can perform a search for case sensitive letters or whole word. Add bookmarks, use various tools like spell checker, statistics, TeX information, compare, reconfigure, etc. Serif PagePlus Starter Editon is one of the best free desktop publishing software. You can create document for new publication or cover page for books. It supports multiple tabs and lets you design multiple documents at a time. This attractive desktop publishing software lets you add pictures, text in different fonts, different templates, various shapes, various colors, etc. You can save and print your own created documents. File>New option lets you open screenplay, sitcom for tape, sitcom for film, and stage play. These options open new document to design. 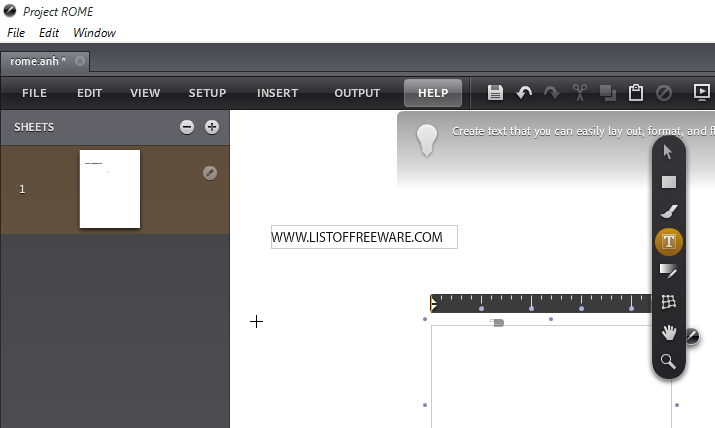 It let you save your design in .sws, .rtf, etc., formats. Note: You need to create an account on its website to download this software. Once you have created an account, verify your email, then you can easily download and use this software for free. There are some features which are blocked in the free version; to unlock these features you have to purchase this software. 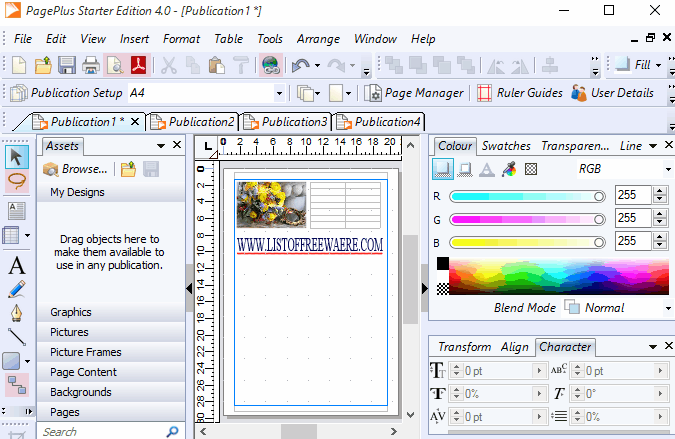 Spring Publisher is another free desktop publisher software. Business card, Letterhead, postcard, etc. can be created easily. Insert text, image, map, shape, bar code, logos, etc. Image effects options are available, such as: opacity, shadows, border, filters, rotation, etc. New Project option lets you create document from a blank page. You can also choose a template from the list. Compatible Platform: Windows 10, Windows 8, Windows 7, Windows Vista, Windows XP, and Windows 2000. Note: Free version of this desktop publishing software lets you design documents with limited features and save documents in low quality. OpenOffice Writer is a popular open source Word processor, which can also be used as a desktop publishing software. It has a list of Wizards which let you create documents for different purposes. It lets you create Letter, Fax, Agenda, Presentation, Web Pages, Business Cards, Templates and documents, HTML Documents, Drawing, Database, Spreadsheet, etc. Insert Date, Time, Author, Title, Subject, Special Characters, Header, footer, Head notes, Foot notes, Frame, Table, Picture, Movie, Sound, Floating frame, File, etc. Editing tools: auto correct, spelling checker, word counter, line numbering, etc. Compatible Windows versions: Windows 10, Windows 8, Windows 7, Windows 2K, Windows XP, Windows, Windows Vista, and Windows 2003. Project ROME is a free software for publication of documents. It can create a documents using text, videos, images, animation, audio, graphics, etc. You can even open an existing document and edit it. Create a new document using different templates. Insert various shapes, symbols, puzzles shape, files, clipping frames, layer stacks, map, bitmap image, etc. You can customize templates sizes. Finally, save your created file as .anh format. It is multi-platform supported software: Mac and Windows. Note: Adobe AIR should be installed to run this desktop publishing software on Windows. Also, note that this software has been discontinued, but its free version is still available that can be downloaded and used for free. 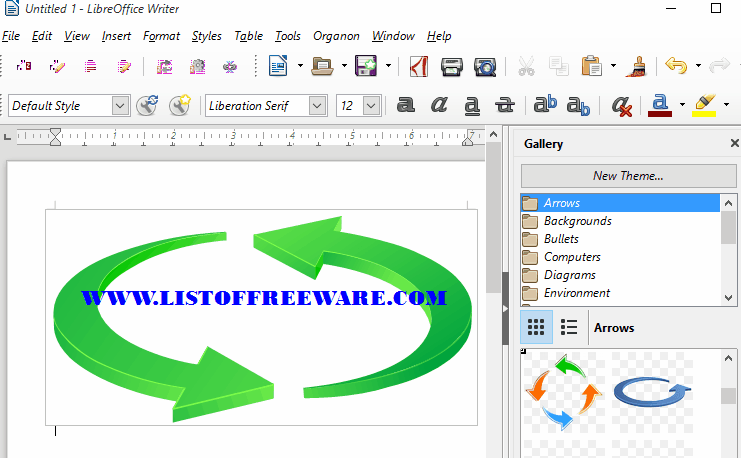 LibreOffice Writer is another free word processing software which can be used as desktop publishing software as well. Create a document to be published through File>New and open text documents, database, HTML document, XML document, Labels, business card, templates, etc. It contains some templates design and you can also create your own templates. Use images, colors, background colors, text, shapes, map, text box, captions, frames, media, clip art, hyperlink, table, header, footer, etc. in a document. Finally, save your file as .odt, .ott, .fodt, .uot, .docx, .dot, .xml, .html, .rtf, .txt, etc. This is cross platform software available for Windows, Mac, and Linux. WPS Office is one of the best publishing software. Although it is a word processing suite, still you can design book covers, business cards, XML document, etc. It contains a list of templates, but you have to download these templates. You can save output in .wps, .doc, .rtf, .wpt, .txt, .xml, .htm, .dot, etc. formats. Print and share options are also available. It has options to insert images, graphs, text, tables, different types of symbols, date and time, etc. It is available for multiple platforms: Windows, Android, Linux, and iOS. 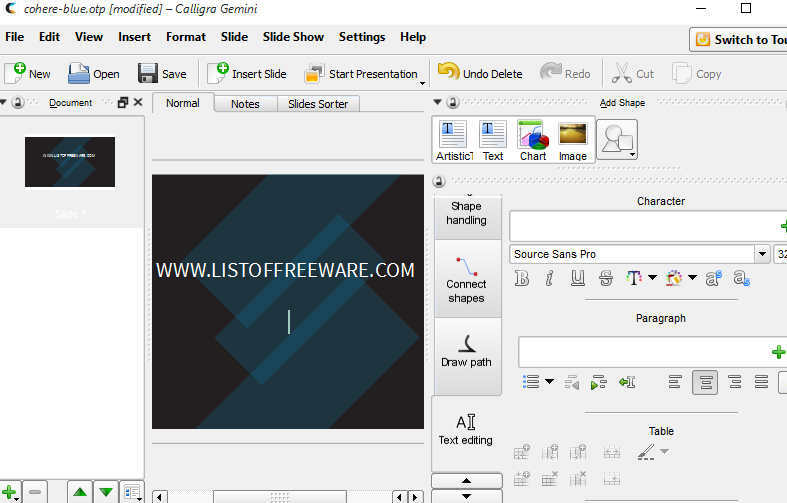 Caligra Words is another freeware which helps you to create and publish different documents. It can open .odp, .doc, .kpr, .kpt, .pptx, .pptm, .ppsm, and many other files. You can add images, charts, clip art, animation, table, shapes, etc. in your document while editing. You can even use various inbuilt templates. It can save, print, and share your document through mail. It can save files as .odp and .otp files. Even though it is not a full fledged DTP software, but it can still be used for basic purposes. Supported platform: Windows, Mac Os, BSD, and Linux. Mobisuse is a freeware which can create and publish a document. It lets you create publishing document for Windows, iPhone , iPad and many other devices as well as platforms. It has some templates which can be downloaded online. You can add image, text, text boxes, button, shapes, video, audio, etc. Note: Free version doesn’t lets you add animation to a document.